Wowsers! Walgreens has been on the back burner lately - sorry friends! --Orbit, Stride, Eclipse, ID or Trident gum -$0.79. Use $1/2 Stride (SS 4/7). Final Price: $0.29 each when you buy 2. --Always or Tampax select products - $3.99 and earn $1 RR. Use $1 off (May PG). Final Price: $1.99 after RR. --U by Kotex - 2/$8 and earn $3 RR on 2. Use $0.50 off (SS 3/24). Final Price: $2.00 each when you buy 2 after RR. --Pampers jumbo packs - 2/$20 and earn $2 RR on 2. Use $1.50/Cruisers (printable) or $1.50/Swaddlers (printable) or $1.50/Baby Dry (printable) or $1.00/2 (May PG). Final Price: as low as $7.50 each when you buy 2 after ECB. Okay so I promise, I really AM alive! The end of the school year is always burn out time for me plus with a few other things going on it has been hard to get these posts up. Just hang in there for a few more weeks until summer and I PROMISE to be back at it more frequently. --Spoiled Nail tote with flip flops - $9.99 and earn $4 ECB. Final Price: $5.99 after ECB. --Lady Speed Stick deodorant - $2.49. Use Buy 1 Get 1 Free (SS 4/28). Final Price: $1.25 each when you buy 2. --Right Guard, Dry Idea deodorant or Total Defense body wash - 2/$6 and earn $1.50 ECB on 2. Use $1.50/Right Guard Extreme (RP 4/7) or $2/2 Right Guard Defense products (printable). Final Price: as low as $0.75 each when you buy 2 after ECB. --Gillette Fusion Proglide or Venus razors - Buy 2 and get $5 ECB. Use $3/Venus (RP 4/7) or $5/2 (May PG). Final Price: varies on the razor you choose to get BUT you could snag two for less than $2 each after ECB! --Crest ProHealth rinse or paste - $3.49 and earn $1 ECB. Use $1 off (May PG). Final Price: $1.49 after ECB. --Oral B Pulsar or Cross Action brush - $5.99 and earn $3 ECB. Use $1 off (May PG). Final Price: $1.99 after ECB. --Pampers - $9.49. Use $1.50/Crusiers (printable) or $1.50/Swaddlers (printable) or $1.50/Baby Dry (printable) or $1.00/2 (May PG). Final Price: as low as $7.99. What a better way to celebrate your 110th birthday by having the 8 original crayons are throw a birthday bash at the new fun-omenal Crayola Experience, the world's only interactive Crayola family attraction. Right now, these crayons are out on a colorful adventure to spread the news, and you're invited to join the fun! 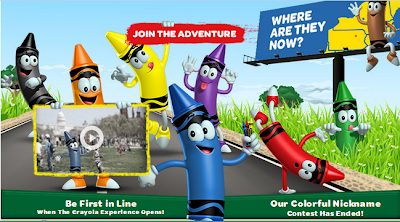 You can FOLLOW the crayons on their adventure, LEARN more about each color and enter to WIN a trip for four to celebrate their birthday and the Grand Opening of the all new Crayola Experience this coming May, 2013! So don't miss out and join the party! Let's celebrate the brand of crayons that we all have learned to love and trust! Disclosure: Crayola provided me with the information for this post. I was not compensated for this post other than a product sample. Nothing is worse than opening your fridge and getting whiffs of last night's leftovers or those vegetables you forgot were in the drawer. Personally, I don't have time to clean my refrigerator every week. So I needed to find a solution to mask the smells that would escape every time I opened my refrigerator door. The box of baking soda just wasn't cutting it anymore. A few weeks ago I reviewed a Robby Wash Ball from Oransi. 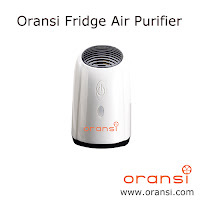 As I was browsing their site I noticed the Oransi Fridge Air Purifier that cleans the air in your fridge and helps to eliminate those odors and make it smell good. Right there I was sold! I started using my Oransi Ionic Fridge Air Purifier two weeks ago. It was super easy to get started - I just popped two double A batteries into the bottom, turned it on and placed it in my fridge. Within a few hours I could totally tell a difference! I love that there is no need to worry about replacing filters or cleaning it. Plus there's a built-in micro processor that will turn the air purifier on and off to help save battery life allowing you to not have to change the batteries for every two or three months. So basically you're paying about $1 a month to clean your fridge -- love that one! The Oransi Ionic Fridge Air Purifier is super quiet and small enough to fit in any nook or cranny that you want to hide it within your fridge. The Ionic Purifer has a patented Piezo-electric technology which allows for a high negative ion output to freshen your refrigerator without the harmful side effects of ozone that is found in standard ionizers. So it's an Earth friendly approach to getting rid of those stinky fridge smells! Within a day, the Oransi Ionic Fridge Air Purifier had cleared my fridge of those terrible food odors -- including a night of a leftover Chinese food! It's small, convenient and has made my life so much easier since I don't have to bust out the cleaning supplies every week to scrub away those smells. Trust me moms, it's the best fridge purifier on the block! --To purchase your Oransi Ionic Fridge Air Purifier visit their website. It retails for $39.99 but is currently on sale for $29.99! You can also visit their Facebook page for more information on this great product. --One (1) lucky winner will win their very own Oransi Ionic Fridge Air Purifier. This giveaway is run via Rafflecopter. The more entries completed, the better your chances of winning! Open to US residents only. This product review was made possible by Oransi. I was not compensated for this review other than a product sample. All opinions are 100% mine. 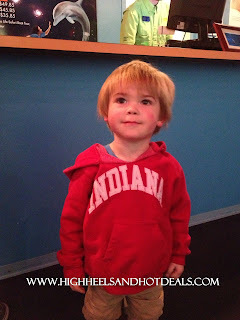 Saturday was a big day for my little man - we took our first trip to the dentist! After his two year check up, his doctor recommended that we take our shark to visit the dentist. 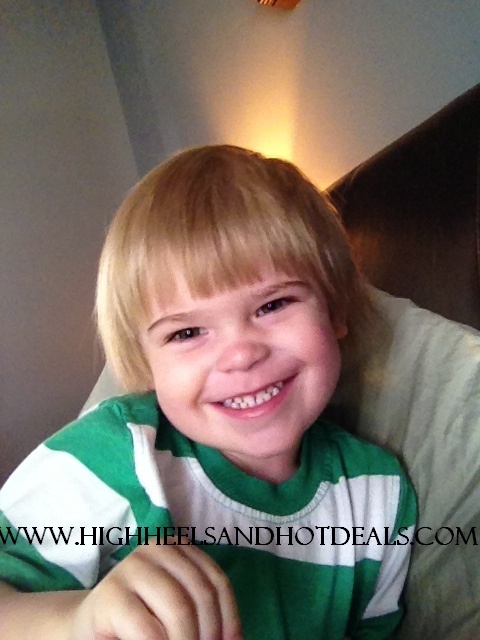 The kid cut his first teeth at four months and had all twenty of his baby teeth before his second birthday. So, considering we have a mouth full of chompers, we decided two and a half was a perfect time to take our first trip to the dentist. We were up bright and early and out the door by 7:45 to make our 8:00 appointment. Surprisingly Cohen was in a fabulous mood (God was looking out for me) and we headed into the office together. The hygienist brought us back to this little room with toys for Cohen to play with as I shared his teeth history. Then, we just laid him down on our laps and cleaned his teeth right there. 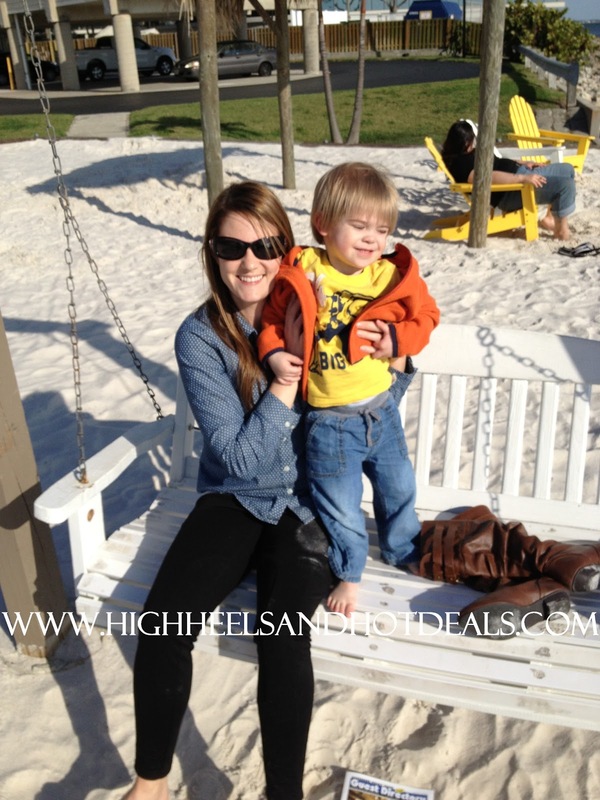 I thought it was a great way to transition him into the process without scaring him with the big chair and tools. He screamed like a champ as she polished his teeth. But as soon as the dentist came in to check out his teefers, he smiled and played and listened to every little thing he had to say to him. It's amazing how my child responds to older men - seriously, I think he believes they all are his Papa so he automatically listens. Overall his teeth look great but we may have a slight under bite to worry about possibly in the future. But we both survived and Cohen was amazing. And he charmed his way into the hearts of several of the ladies in the office of course. Another gold star towards that "Mom of the Year Award" if I do say so myself. Alright, so I'm a few days late. But last week was brutal. I'm hoping this week I can turn things around a little more. --Pepsi or Coke 24 packs - $6.50. Get $2 off instantly when you buy 2 Final Price: $5.50 each when you buy 2. Not a great week but a few goodies! Congrats Cassandra! You have 48 hours to respond! Thanks again to all who entered and keep following for more HOT giveaways coming soon! Oh hey, I really AM alive. Let's just say if you could look up poop in the dictionary, a picture of my pathetic face would probably show up next to it. No, not because I am poop but because that's the way I feel these days. I really need to summer to hurry up and get here. But I decided to throw together a few goodies you can grab at my favorite store this week before the sales change. You know you've deprived your child of Target as you pass the store and he starts crying, "Mama! Stop! Corn and Shushie!" Okay, maybe he's just a little popcorn and slushie deprived. Before you head, text UPUP to 827438 to get some HOT Target mobile coupons sent right to your phone for deals off of a ton of Up&Up products. I thought this week's mobile coupons were a little weak. --Up&Up ibuprofen - $0.99. Use $1/2 Target coupon (target.com). Final Price: $0.49 each when you buy 2. --Right Guard Extreme deodorant - $3.49 and buy 2 and get 1 Free. Use two $1.50 off (RP 4/7). Final Price: $1.33 each when you buy 3. --Almay intense i-color shadow, mascara or eyeliner - $4.99. Use $4 (SS 4/14) and $1 Target coupon (target.com - beauty). Final Price: FREE -- I LOVE this stuff!! --Pampers wipes - $2.00 and buy 2 get the 2nd for $1.00. 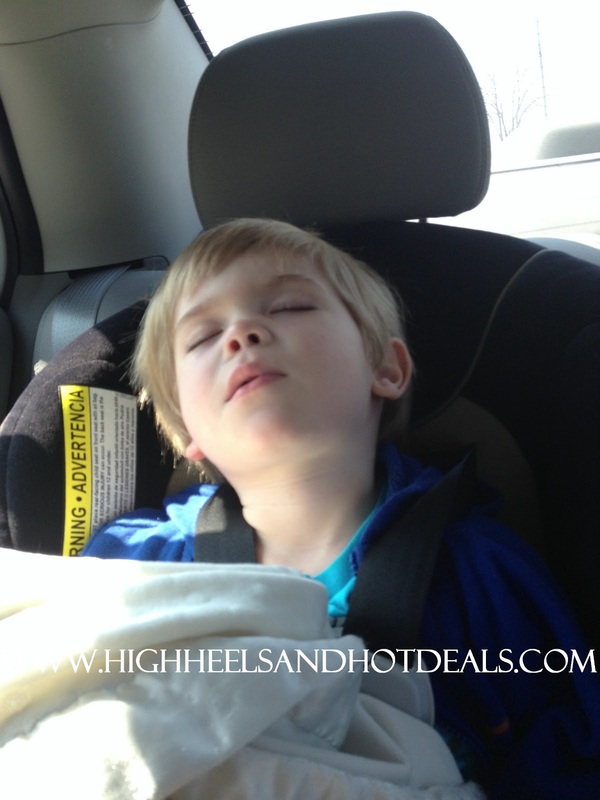 Use two $0.50 off (printable). Final Price: $1.00 each when you buy 2. Now it's time to lay down again. Apparently I pushed myself too hard with this post. Congrats Shelly! You have 48 hours to respond! Thanks to all those who entered and keep following for more great deals and giveaways! I know, I have been slacking. I apologize for no CVS posts last week. But I'm baaaaccckk! Hello my friends I am back -- well, at least I'm attempting to be at this moment! I promise to be better about posting. Life has caught me up, twirled me around and made everything around me dizzy...literally. On a good note if you didn't make it to Meijer last week to use the 5% off grocery mPerk (like myself, of course) then you can grab it Sunday and Monday of this week now! Thank God because my pantry, fridge and freezer are scarce. This week it's a 10 for $10, get the 11th item free week. I'll post a few good match ups before I post those deals! --Buy 4 Kellogg's, General Mills, Post or Quaker cereals and get $2 off instantly. General Mills cereals - $2.50. Use $0.50/Cocoa Puffs (printable) or $0.50/Cheerios (printable) or $1/2 adult GM cereals (printable) or $1/2 Cheerios (printable). Final Price: as low as $1 each when you buy 4. --Betty Crocker Helpers - Use $0.75/3 (SS 3/3). Final Price: $0.75 each when you buy 3. --Pillsbury Grands biscuits - Use $0.50/3 (SS 2/24). Final Price: $0.66 each when you buy 3. Cohen is now officially two and half. So we are have way through the "terrible twos" now. God, I could seriously kiss those cheeks forever! He amazes me at the things he picks up. For example, we were playing outside and heard some bird chirping that sounded like an owl. Cohen insisted, "Mama! Owl! Hoo hoo!" That's some serious connecting my little man! Lately he's really been into parroting what other people say. Sometimes it is all fine and dandy. Other times, well, let's say I probably want to duck and cover. For example, Monday after school we were doing our afternoon call to Dad in the car. As I ended the call in my car, it will say over the speakers "Call Ended" in a seductive British voice none other. Cohen then immediately repeats, "Call ended!" Made me laugh out loud a bit. Then, last week on the way home he serenaded me to a lovely sing along with Mumford and Sons. 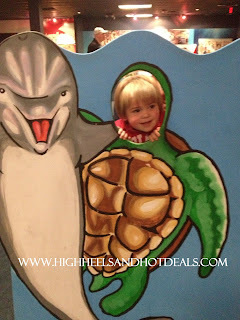 There's something about a two year old's singing voice that hits that sweet spot. My heart is still melting. Tonight as we are getting ready for bed, I was brushing his hair in the mirror. Every night since the kid has had hair long enough to brush, I ask my husband which way to part his hair. He then reassures me by taking the comb and saying "This way." So, tonight Cohen decided he wanted to brush his hair. He starts to brush it, then stops and looks at us and says, "This way?" Precious, seriously. However, like I mentioned earlier, this "Parrot Syndrome" isn't always cute. Last Thursday I went to pick up Cohen from his sitter and she informed me that he told her several times after he pooed, "Tara, I sh*t."
I was shocked! Let's get this straight - never in my life has my husband or I said to him or referred to his poo as the s-word. I thought, maybe she misheard him? I mean, he does have a cute little lisp right now which makes you question some of his words. Well, don't worry. As soon as we got home he decided to make a big ol' poop (in his big boy underwear my I add -- double vomit). So I laid him down to clean it up and as I'm cleaning up the mess he says, "Mama! I sh*t! Sh*t! Sh*t! Sh*t!" Flustered I tell him, "Cohen, we don't use that word. That's naughty." Realizing that when I acknowledge him saying the word it makes it worse - I try to distract him with a new one. So I tell him, "Boo yeah! I'm all done cleaning up!" We continued to use boo yeah the rest of the night. Tonight as we're winding down for the night on the couch, he looks at Kurtis, pinches his cheeks and yells, "Boo yeah!" Well, it's better than sh*t, right? My job as a teacher keeps me on my toes. Unfortunately I don't have the flexibility to grab a soda or go to the teacher's lounge to grab my lunch when I'm hungry. So I had a lunch situation -- and I needed a solution that would keep my lunch cold for the duration of the day, especially when I needed a quick snack mid morning. I needed to be able to keep my lunchbox with me and keep it cold at the same time. What was my solution you ask? The most clever lunch bag invention yet -- the PackIt Personal Cooler! The Personal Cooler is the perfect size for your daily lunch and snacks and it keeps your food cold for up to 10 hours! And no, not with freezer packs that you stick in your box like we used when we were kids. The PackIt Personal Cooler easily folds up so you can store it in the freezer for up to 12 hours. The bag is lined with a freezable gel-liner so it freezes when you stick in the freezer and continuously keeps your food cold until you're ready to eat it. Genius I know! The PackIt Personal Cooler is perfect for work, you kid's lunches or even for a long road trip in the car. Moms - need to keep your little one's bottles cold? Throw them in your PackIt to ensure they stay cold for several hours! These coolers really keep your food and beverages cool until you're ready to eat. Another great feature of the PackIt Personal Cooler is the fact that it is reusable, non-toxic and earth safe. Think of all the bags you aren't wasting by using the Personal Cooler. So it's convenient AND helps you take that extra step towards a greener lifestyle. The PackIt Personal Cooler definitely is the choice to make! The PackIt Personal Cooler makes lunch time (and snack time) convenient while keeping your food cool and fresh. I'm so in love with my Personal Cooler that I don't think I'll ever be able to use another lunch bag again! --For more information, check out PackIt's website to see their line of Personal Coolers. You can also follow them on Facebook and Twitter. --One (1) lucky winner will win their choice of PackIt Personal Cooler. This giveaway is run via Rafflecopter. The more entries completed, the better your chances of winning! Open to US residents only. 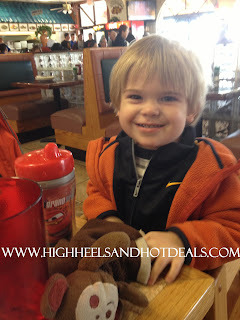 This product review was made possible by PackIt Personal Coolers. I was not compensated for this review other than a product sample. All opinions are 100% mine. Congrats! Emails have been sent and you have 48 hours to respond! Thanks for all who entered - keep following for more HOT giveaways coming soon! It was so nice to see the sun today and the fact that it was 60 degrees made it even better. Then I came home to dinner already cooked in the crock pot so I could go on a run with Cohen and Brady -- seriously best afternoon ever! Plus this Friday and Saturday you can score an extra 5% off your grocery purchase -- so clip the mPerk! And you can save up to $5 when you buy 20 Meijer products. So let's get some match ups to make this a GREAT shopping week! --Lance crackers - $2.00. Use $1/2 mPerk and $0.50 Ibotta deal (Ibotta). Final Price: $1.25 each when you buy 2. I'll post more deals I find after my excursion this weekend! $3 off The First Years Sippy Cups! Even though we have transitioned Cohen to a regular cup, I still depend on those sippy cups. However, some of those cups can be a pain to wash, put together or make sure the valve is in the correct place so it doesn't leak. But then many times it still does leak and then I find little puddles on places like my new couch. I recently had the opportunity to try out The First Years Gripper Sipper Non-Insulated Spill-Proof cup. This cup is just a simple lid and cup -- and it doesn't leak! The lid has a built in leak protection so you don't have to mess with taking it apart or worrying about it being put together so it won't leak on you. And I promise you -- these cups don't leak! They are the perfect size and the grip on the cup makes it easy for your little one to hold on to it too. 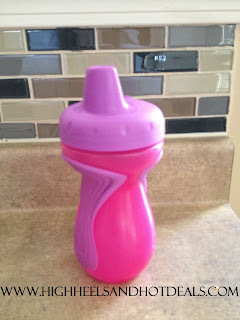 Plus you can throw them right into the dishwasher to clean and they are BPA free (I know, I worry too!). 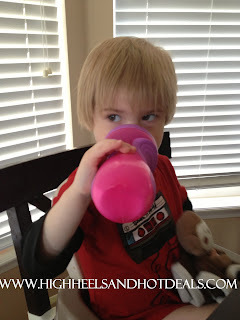 Cohen loves his cups (real boys wear pink by the way) and has no problems drinking from it -- which I find to be the case sometimes with certain sippy cups. The Gripper Sipper Spill Proof cups are perfect for your little ones as they transition away from the bottle. But what would make this even better would be a great deal on these cups, right? Don't worry -- I have you covered! Head on over to "like" The First Years Facebook page and print yourself a $3 off coupon redeemable at Walmart. Right now a 2 pack of the The Gripper Sipper Spill Proof cups retail for $6.96. That means you can grap two of these amazing cups for less than $4 -- that's less than $2 a cup! Can't beat that kimd of deal! I promise, the The First Years Gripper Sipper Non-Insulated Spill Proof cups are perfect for any little one in your family -- and your new couch will thank you for it! This product review was made possible by The First Years. I was not compensated for this review other than a product sample. All opinions are 100% mine. Well, we finally did it. We bit the bullet and took a vacation, just the three of us. We decided in February we were going somewhere so I got online, booked it and decided there was no going back. Trust me. I got super anxious, especially as a foot of snow decided to fall Sunday night before we left. I kept thinking of what I would do if I had to cancel the condo or just take the airline credit. A tiny part of me wanted to just stay home snuggled in bed all week and not feel guilty that I had to cancel it all. But we made it and I'm so glad we did! We flew out to Tampa Monday and stayed through Friday. Honestly it was the perfect amount of time. I may have stayed one night longer however I would have convinced my mom and dad to come along for the extra hands. 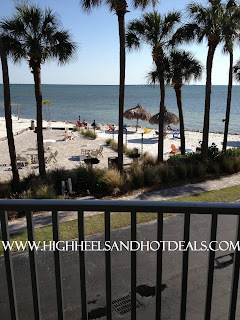 :) Our condo was right on the bay - a gorgeous view and perfect for our family. Even though we ended up all sleeping in the same bed, it was a much better choice than a hotel. Plus I ended up going to bed around 8:30 every night with Cohen. Basically I played sleep catch up on break and I wasn't complaining. Florida decided to get the cold front from our awesome winter weather. The temps for the majority of the week were around 65. However, the sun was out in full force which made it feel a bit warmer. 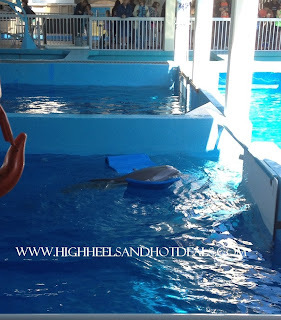 It was perfect weather to visit the zoo, the aquarium and even see Winter the dolphin from a Dolphin's Tale. One day Cohen fell asleep in the car so I had my husband pull the car up next to the big deck that overlooked the bay at our condo. He slept and I relaxed in the sun in jeans and a sweater. And I got burned in jeans and sweater. Trust me folks, you can still burn in Florida when it is 60 and you are wearing jeans and a sweater. We spent our last day at Clearwater playing on the beach. Cohen wanted to swim in the ocean so badly, however it was just a bit too cold. I got him to settle for a football instead. Even trade I would say. Cohen did really well on the flight. On the way home it was nonstop, so it was a bit longer than on the way. He passed out and my husband annoyingly woke him up. Therefore the last 20 minutes of the plane ride our friendly planemates were exposed to a nonstop grouchy cry fest. Our first family vacation was such a great time. I think we are going to make it a yearly occurrence during spring break. However, this time I will start planning like next month. This last minute planning was a little stressful for me. But I'm so happy that I finally sucked it up and did it. And I survived a vacation with a two year old. I'm super excited to go raid the Easter candy tomorrow and see what sales I can grab. Plus I need to fill up our "Potty Treat" bowl because we're getting low. That's not all because Cohen has been using the potty (which is he getting really good at). I can blame the empty bowl partially to his father, whom I caught enjoying in front of the TV the other night. --Cliff Crunch Bars (box of 5 double pack bars) - $2.99. Use $1 off (SS 3/10). Final Price: $1.99 -- LOVE these things! I love that it is already April! Only 40 days of school left until summer break. 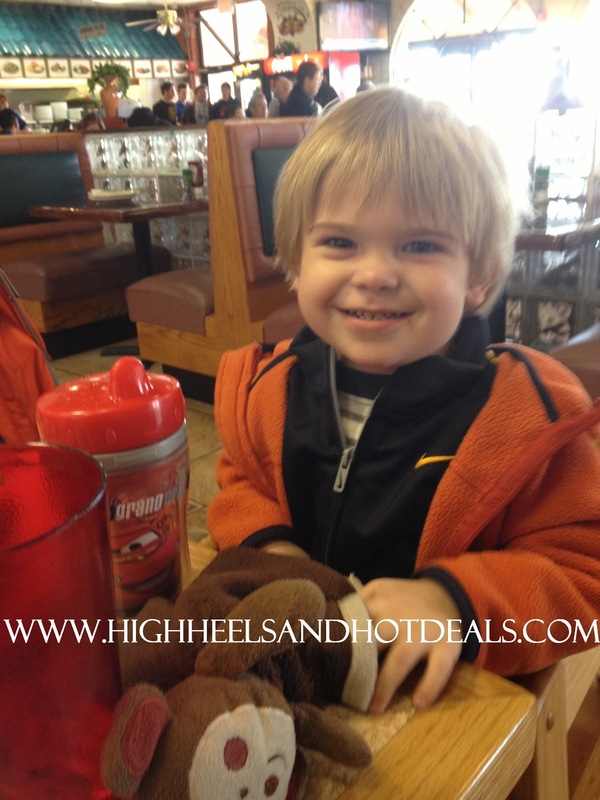 Alright, here are this week's best deals for your tots! --Pampers jumbo packs - 2/$19. 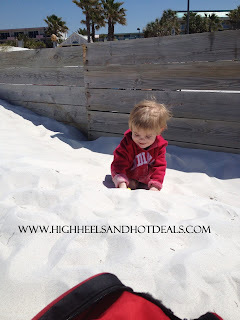 Use $1.50/Baby Dry (printable) or $1/2 (April PG). Final Price: as low as $8 each when you buy 2. Even though my son is just about 2 and a half, he is so technologically savvy it is unbelievable. I'm not joking when I say that sometimes I think he knows how to do things better than my parents. He loves to play on my phone, tablet or computer every evening as we are winding down before bath and bed. I remember seeing commercials for ABCmouse.com on a few of the stations that we watch together so the teacher in me decided to check it out. I mean, he is constantly playing online so why not find a program that helps him grow academically, right? 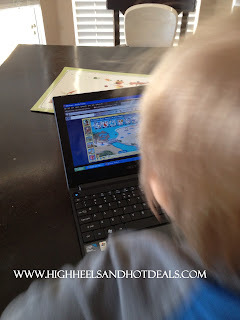 Well, I was amazed at how much ABCmouse.com has to offer for little ones starting as young as 2 years old! The program encourages early literacy skills and helps kids build that phonics foundation to become readers. But ABCmouse.com also focuses on subjects such as math, social studies, art and music too. The set up is kid friendly and real easy to navigate. It takes you lesson by lesson to help improve your skills based on your starting level. For example, with Cohen we started obviously at the very beginning with just letter recognition. He gets to explore the letter "a" through song, pictures, puzzles and games while helping him make connections to the letter and objects that begin with that letter. 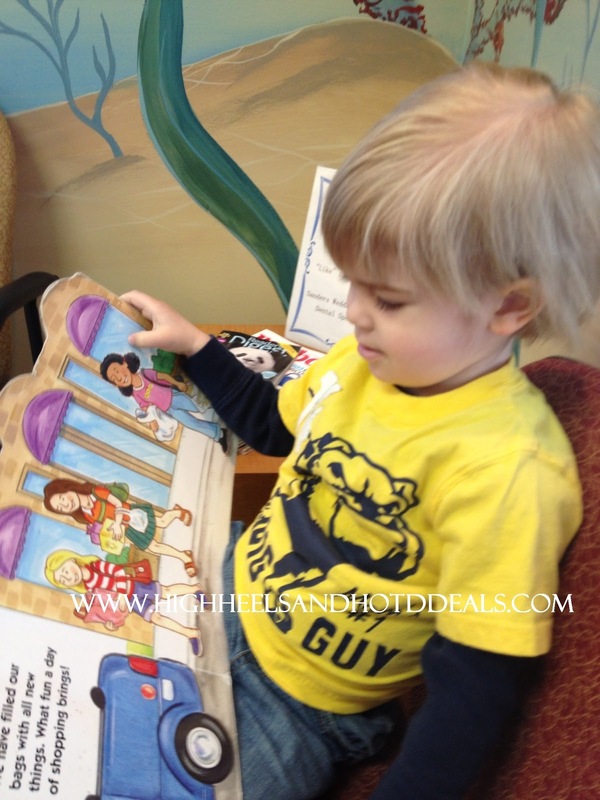 The program is super engaging for even little ones who may have shorter attention spans! Once everything is set you, your kiddo is ready to go! It took us a bit to get used to and can be a bit overwhelming at the beginning. However, we explored the program together several times and he is getting used to the lessons after working on them together. Eventually, as Cohen grows with the program, I have the opportunity to customize his lessons based on the ares where I think he needs the most work. But for right now, we are doing the Step-By-Step Learning Path which gives him a basic overview of all the subjects in the program to help him learn and grow in all of the areas. One of my favorite things about ABCmouse.com is the fact that Cohen loves to play yet is learning at the same time. At first, I decided to set a time aside at least four nights a week for him to spend time on the program. However, whenever he sees my computer out he always asks to play! It also allows us to spend time working on these skills together, which makes it fun for both of us. 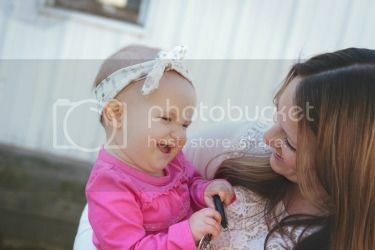 I love having my Cohen time laughing, playing, singing and learning every evening. Plus he is learning essential computer skills that even at a young age are important. He's starting to understand how to move the mouse and click on his own without much of my help anymore. ABCmouse.com is an engaging learning program for young children. As a parent and teacher, this program definitely has exceeded my expectations. I love that it is teaching my child important lessons to help him grow as a reader and student as well as encouraging computer skills that he will need in the future. Most importantly, ABCmouse.com has captivated my two year old son and made learning fun for him, which is a passion that I hope to continue to instill in him throughout his academic years. --For more information, visit ABCmouse.com to set up your 30 day free trial. Subscriptions can be paid monthly or yearly. A year subscription to ABCmouse.com is $79.95. --One (1) lucky winner will win a one year subscription to ACBmouse.com. This giveaway is run via Rafflecopter. The more entries completed, the better your chances of winning! Open to US residents only. This product review was made possible by ABCmouse.com. I was not compensated for this review other than a product sample. All opinions are 100% mine.